UPDATE: We've reshot this wonderful potato trick (a crowd favorite since we first ran it in 2010) and attached a slideshow of Amanda making them anew. See below! Yes, I know I just recently wrote about Tad's Roasted Potatoes, and his technique of using old white potatoes and roasting them in a cast iron pan to maximize the caramelization. I do love them, I really do. But then I remembered another great crisping technique, one I learned from Susan Spungen's underappreciated book, Recipes. In her version, which she calls Potato Tostones, she has you steam small white potatoes, lightly crush them in your palms and then crisp them in oil. I've made her recipe many times and recommend that you do too! But this week, I wanted to take the potatoes one step further and really flatten them before crisping them in the pan, so there would be a thinner creamy potato center and a thicker, more perceptible crust. Susan also keeps her potatoes pure and minimal, seasoned with only coarse sea salt. I wanted to add some other flavors. I began by forgetting to steam the potatoes, a mix of baby white and fingerlings, and instead plowing forth out of habit and boiling them. Then -- and I know this will surprise regular readers -- I used my handy meat pounder (see it in the photo above -- isn't it adorable?) to flatten the potatoes to 1/4-inch thick. With the first batch, I decided to spread them with a thin mustard and thyme paste during their last turn in the pan. And this was a total failure. The mustard burned. The potatoes skins were bitter. Which, had I thought about it, makes a lot of sense: when trying to get a crust on potatoes, you don't want to put anything other than oil between the hot pan and the potato. Chin up, I next cooked them without the mustard and kept the heat low so they browned in their own sweet time. This produced browned potatoes but no crust -- turns out potato skins prefer to bubble and singe when sauteed. I also figured out the difference between the potato types. Fingerlings cook better with this boil-then-brown method, because they hold together when squashed. The baby whites, although sweeter and more moist inside, fall apart a bit and can look like exploded amoebas. I'll leave it to you to choose your potato variety. In the last batch, everything came together, and I discovered two crucial details. If you peel the potatoes before browning them, they get much crisper -- much like a hash brown without all of the hassle and heft. And if you want to add other seasonings, you need to chop or grind those herbs and spices fine enough to sprinkle over the crisped potatoes so the heat draws out their fragrance on the way to the table. Originally, I thought I'd work the classic garlic and rosemary duo, but then I tried a simple seasoning of coarsely ground coriander, freshly grated black pepper and coarse salt. The coriander lends a citrusy scent and the coarse flakes from the spices add to the sense of crispness in the potatoes. What I like best about these potatoes is that you can boil them in advance, keep them chilled in your fridge, then peel and squash a few whenever you have a mouth to feed. Or a desire to use your meat pounder. See and save (and print) the recipe here. Oh these do sound delicous, going to make them at the cottage this weekend for brunch! Will try both herbed versions...rosemary and the coriander recipes! Thanks for sharing!! Where can I get that "smasher" tool? Can't wait to make these this weekend with poached eggs! You can get a non-marring rubber mallet at Home Depot for about $5. I got mine at Container Store to put together some shelves - it worked its way into my kitchen and never left. I have used it to smash peanuts for coating caramel apples, for cracking olives for curing, and now for smashing potatoes! It has heft but won't dent your countertop. oh, this is funny. I have a rubber mallet in the tool drawer. I'll just give it a good wash & I'm good to go. Isn't this how the lowly rasp became the citrus grater of choice? perfect. I had just cooked up a pot of fingerlings and forgot to serve them at dinner. I know how I'll be serving them tomorrow! Yes -- great for leftovers! Two family favorite recipes we've been making for years in one day! This and the Summer Berry Pudding. We make these with the small red bliss potatoes and just use a dish towel and the heel of our hand to smoosh them. Duck fat would be awesome, but when we make them for brunch - we use bacon fat, and caramelize some red onions with the taters. Thanks for sharing your method -- love the bacon fat idea. my boyfriend does this(kind of) with sweet potatoes. he bakes them for about an hour and a half or so, then cuts them in half and pan fries them, smashing them with a spatula. a little bit of olive oil and a sweet potato. so salt or sugar. they are amazing. Sounds divine -- thank you. You inspired me to try these for lunch just now - amazingly, fabulously delicious! I used tiny Dutch potatoes, boiled them, then squished them between sheets of wax paper using my trusty mallet. The skins on these little spuds are so delicate, I left them on. Crisped them up, as directed, with garlic in olive oil. Ground some pepper and salt over them and sat down to a marvelously savory, crispy yet creamy treat. Wow -- thanks for trying them so quickly! Love, love, love these. This is taking roast tatties up a notch! I think it will be much more fun to smash these by hand. Love the idea of having them ready to go in the fridge. These will go so well with some of the flank steak recipes, too. Also ordered some of the Tunisian couscous....there will be lots of choices for side dishes. I better get some more company lined up for this weekend! Great point -- should have run this next week with the flank steak finalists! Yum. And ... think duck fat!!!! My after work trick that goes with this comes out really yummy -- a quick zap of the potatoes in the microwave, smoosh them with your hand, drizzle with a bit of olive oil and pop them into the toaster oven on broil for a quick crisp. Fast, delish and nothing to clean up after! This is what I love about cooking -- creative improvisation. Oh my word.....If I didn't want to party company with my microwave, I would try this. Well I can still attempt the toasting part! Genius - thank you. yum! i did this with sunchokes last weekend and they were so unbelievably tasty that i burned my mouth. but soo worth it! Never would have thought to use sunchokes -- thanks for a great tip! This turned out really fantastic and were really easy. Best of all the kids loved them! Thank you! So glad -- love receiving reports from the field! In Berkeley there's a great tapas place called Cesars. Perfect in every way. My favorite item by far (aside from their vodka martini) is french-fried shoestring potatoes tossed with fried herbs and served in a precariously-piled mound. The most compelling detail is the flash-fried herbs -- sage and rosemary crisped and salted to perfection -- a combo that sends the earthy potato-taste heavenward. I have approximated the fried herbs at home (I’m sure Cesars must use a deep-fat fryer). Heat oil (all I've tried so far is olive oil), toss in the rinsed and dried herbs in batches that do not overwhelm, wait not so very long and watch closely, remove herbs with a slotted spoon, toss with a bit of salt -- then add to whatever potato you have going. I've dressed diced and fried potatoes this way and mashed potatoes too. The trick (as I'm sure anyone would guess) is not to overdo the herb-in-oil time. Also, sopping up the fragrant oil with fresh bread is delicious. Thanks for this -- have always wanted to go to Cesars. Man, that mustard/thyme combo would have been killer. I wonder if dried mustard would have worked? Like if you cooked the smashed potatoes until they were almost done, then sprinkle a little on each side. Like this idea -- will try it next time. A favorite recipe for 'smashed potatoes' calls for smashing boiled potatoes flat, brushing tops with oil, sprinkling with salt and pepper and baking in a very hot oven until crisp. Great with fresh herbs or other seasonings added. Wish I had some now. Baking is great, too, because the tops crisp at the same time (and it makes less of a mess of your stove). What temp is your oven? I use the meat pounder trick a lot. I like to employ excess laziness and just squash the taters in the pan. These'll go great with next week's roast chicken! That's a good idea -- hadn't thought of doing that. I love potatoes, and these sound great. I sometimes use Heston Blumenthal's recipe for roast potatoes and they come out great as well. Basically, you peel, quarter and boil the potatoes until just tender, drain the water, add some olive oil, salt and pepper, cover the pot, then shake the heck out of the potatoes! Then place them on a roasting sheet and bake them until crunchy on the outside but creamy on the inside. Love this British technique -- crisp, shaggy taters! These look perfect, except...try them with duck fat! Duck fat roasted potatoes are a gift from the kitchen goddess. Mmmmm...fried in duck fat would be delicious. I'll have to give that a try. What a wonderful technique for making potatoes! I am going to make these tonight! Thanks Amanda! Whenever I make hamburgers, bacon, or steaks, I like to reserve the excess grease and keep it in the fridge. I then use it when I'm sautee-ing things like spinach or, in this case, frying potatoes. It add all the bacon-meaty goodness with none of the hassle. WIN. Yes, editing and also linking -- on our features to-do list! Totally off topic, but a spell-check feature on the recipe builder would also be great! But ducks are so beautiful! I love all forms of roast potatoes - sometimes I do the boil/smash method too, but usually finish them in the oven. With any roasting method, I sometimes throw in - along with the garlic cloves - a lemon cut in chunks (after squeezing the juice over the spuds along with the olive oil.) 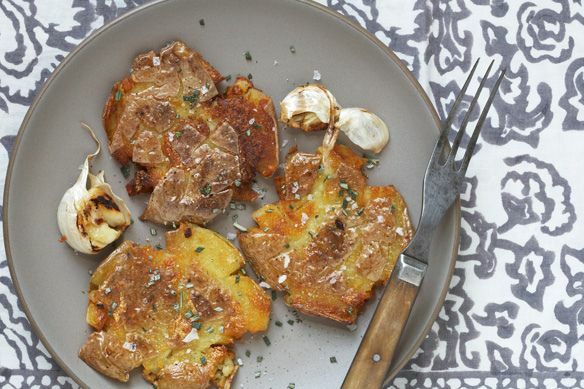 The rind caramelizes with the potatoes and gives them a terrific fresh flavor - I got the idea from some I ate years ago in Greece. Another favorite crispy potato trick is from Patricia Wells - cut them in chunks, saute in olive oil until very crisp with just S&P, then when they're done - and still very hot - toss them with very finely chopped garlic and chives. The heat of the potatoes 'cooks' the garlic just enough to remove its rawness...but it's still a gutsy version - for true garlic lovers only. Of course you can limit the amount depending on who's eating them...and now I'm craving potatoes. Must do something about that. Love the lemon trick. Your comment reminded me just how many great potato recipes Patricia Wells has published. She should collect them in a book. Or here(! ), just for us, because we all seem to like potatoes so much.